Pebble watches are now bonafide activity trackers. Jawbone’s UP and UP24 activity tracker bands were just the start of the company’s fitness tracking ambitions, as the company announced at the beginning of this month a move towards integrating all types of devices with its software. Along with Apple’s Health Kit in iOS 8 and Google’s Android Wear (integration announced but not yet available), Pebble has now been added to the list of devices that connect with Jawbone’s UP service. This allows you to use your Pebble to track your steps and sleep in the background, meaning the UP watch face doesn’t have to be in use for it to be accumulating data. The Pebble can store up to a week’s worth of data This helps bring Pebble’s feature set in line with other step counters as well as other similar devices like the Moto 360. It isn’t perfect just yet. While Jawbone has released the Pebble watchface that links into its service, the UP by Jawbone phone app has not been updated to allow for log in without an UP tracker. Also, one of my Pebbles has been randomly vibrating ever since I added the new UP watchface, while my Steel has been quiet. First round bugs! Another new Pebble app comes from Swim.com. 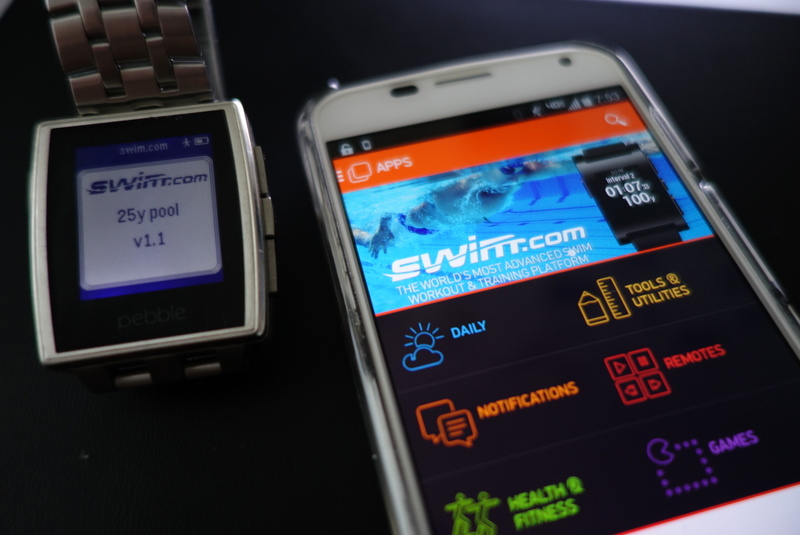 The app of the same name takes advantage of the waterproof Pebble to track your laps. It’s pretty limited now, as it doesn’t provide workouts, but logging onto the website allows you to pick your local pool and connect with friends that may be on the service. Finally, a price drop was included in Pebble’s most recent announcement. The original Pebble is now just $99, with the “more distinctive “Pebble Steel” costing $199. These new features do give the Pebble watches some nice advantages over current Android Wear devices. The Pebble is not dead yet!